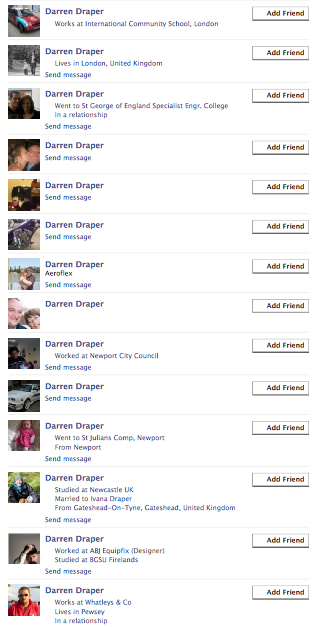 By my count, there are currently forty (40) different "people" with the name of "Darren Draper" on Facebook. Spelled exactly like I do, creepy parallel universes and all. I doubt when my parents decided to run with the name of Darren - you know, not Darin, Daron, Derin, Daryn, or Darrin - they had no idea there were so many already in existence, or soon would be, particularly in England. West Jordan, Utah, never seemed so small. So naturally, when I noticed how many Darrens there were on Facebook, question after question began swirling around in my head. What would happen if I "friend-ed" them? How would I feel if I got a friend request. From myself? What if I friend myself and I end up being a jerk? Assuming I did friend them, is it too paranoid to wonder if the chain-saw-wielding-mass-murdering-type-Darren-Draper out there would then try to assume my identity? Surely life can't be that wonderful for all of us out there. How many of them are wondering the same thing about me? It was hard enough that time I had a female "Daryn" staring back at me while I taught high school Geometry. I'm not so sure I'm ready to be Facebook friends with myself.